“Are we close to Lott?” said the Patient Spouse as we were taking a circuitous route home from a trip. We were, which is how we wound up in Westphalia: it happened to be on the way. Twin church spires had our attention before we even got to town, and of course we stopped to explore. The church – the largest wooden one in Texas – was a great find and we spent a long time looking around. Oh, and Lott? It was regionally famous when we were in college as a place to go to get cheap jeans. We did go there, but the jeans store was out of business so there was no need to stop. 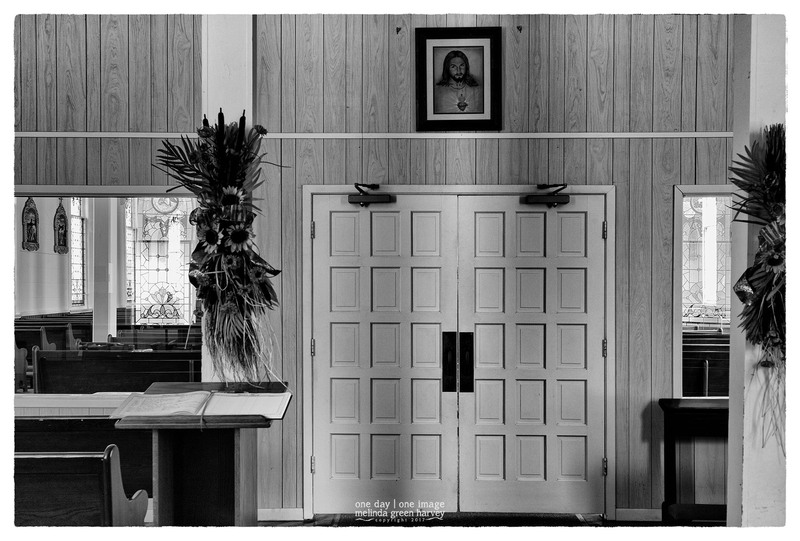 Posted on December 13, 2017, in Photography and tagged 365 photo project, black and white photography, church, church of the visitation, learning to see, Leica, melinda green harvey, monochrome, one day one image, photo a day, photography, postaday, texas, thoughtful seeing, westphalia, westphalia texas. Bookmark the permalink. 5 Comments. The original settlers of the Texas Westphalia named it after the region they’d come from in Germany (according to a brochure we found in the church). I thought the same as Sue! Did you get the other side of those doors – it looks as if it might have the same appearance to the iage you posted a couple of days back. The German immigrants who settled this town came from Westphalia, Germany, so that’s how the Texas town came to be. And yes, I did get inside the church – come back to see those photos!